Dear Wonderful Super Naturally Healthy Readers! I have some exciting news to share with you today (in fact throughout this week even so stay tuned) as today I invite you to come join me in the Green Smoothie Challenge starting next week, the Wednesday 21st January, were we can have some fun, try out some Christmas presents (I know many of you got smoothie makers for Chrimbo!) and see how much better we could feel by adding more green vegetable goodness to our diets. You make sure your smoothie has vegetables in it. I love green smoothies as I think they are great and simple introduction to incorporating more vegetables into your daily diets. They are a great place to begin when it comes to getting healthier and are super accessible. I know some of what I ‘preach’ on, bone broth and grain/gluten free living, can feel overwhelming so start first by ADDING things to your diet and smoothies are a great thing to add. I tend to have a couple a week and often it’s a great way to been like you are having a treat. I often make ‘chocolate’ smoothies that are crammed with spinach but I feel like I am having a chocolate milkshake! 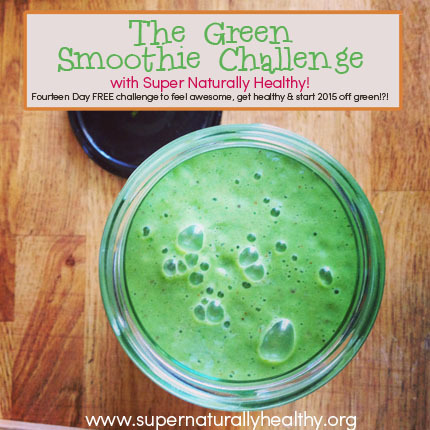 I have loved the green smoothie challenge. I’ve seen improvements in my energy level and generally felt really well for doing it so much so I’m still going with it! I saved money, buying fruit and veg rather than cereals, milk, bread n spreads – is saving me money!! Only downside is green splodges of smoothie over my dressing gown as I blend and pour in a very sleepy state first thing in the morning. Maybe think of buying green dressing gown instead LOL. So it definitely worth joining in on! AND it is free! I was thinking about charging for it and maybe I will in the future but take it as a January freebie from me:) So scroll down to sign up. 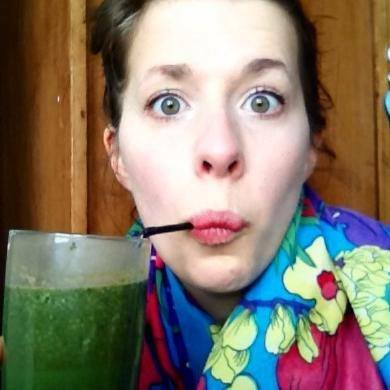 Also on other exciting news I am in the process of writing an entire recipe eBook dedicated to delicious smoothie and juice recipes to that you can have your paws of loads of variations and version of juice and smoothie goodness. I have just started but am hoping to get it too you in March/April time but I will keep you in the loop and let you know if i turn green from testing them all out! Add raw honey or maple syrup if more sweetness required. Adapted from From all the other green smoothie recipes out there! Will you be joining us? What is you favourite smoothie combination?